We are an experienced, award winning team that is passionate and dedicated to creating efficient and sustainable homes that enhance our customers’ quality of life. We accomplish our goals by listening to and communicating with our customers, trades, vendors, and other real estate professionals, and staying current with the latest best practices and products. We value engineer each residence so that our customers get a quality home at a competitive price, with minimal future maintenance costs. Each of our designs is aesthetically pleasing inside and out; providing an aura of warmth, while the floor plans are step saving and practical. We know that people have different architectural goals, and we have many customizable plans to meet the discerning clients. We understand that purchasing a new construction home is a major investment and decision. We approach each construction project with unequivocal integrity, and pay strict attention to each detail. We feel honored and flattered that our customers choose our homes, and allow us to help them create a wonderful environment for their future memories. Steuer & Associates is honored to be awarded the prestigious blue ribbon for the 2015 Parade of Homes. 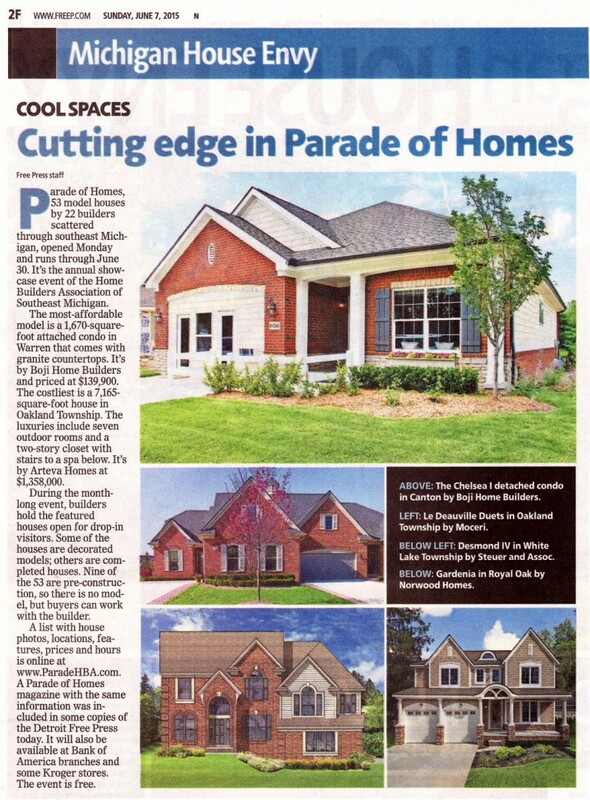 Our Desmond IV home design was featured in the Detroit Free Press on June 7, 2015. "We are very satisfied with our new home and highly recommend your company to others." "We have great respect for your organization in all that you do for us."